I'd had the idea for this study for some time and had two previous attempts at constructing the background — see Unpublished for both studies. 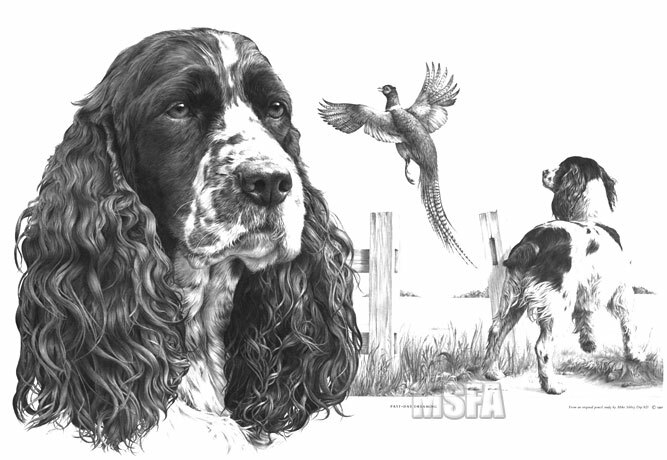 I wanted to find a way of incorporating a working English Springer Spaniel and its show equivalent. You can read what you wish into the title - personally, it concerns me that so many "working" dogs are no longer able to do so — or maybe this dog has just retired? The original drawing took 107 hours 39 minutes to complete and is in my personal collection. Of the two background studies, one is now in the Fox-Silver collection, USA, and the other in private ownership in the UK. image : 18" × 10½"